In The Day We Lost the H-Bomb, science writer Barbara Moran marshals a wealth of new information and recently declassified material to give the definitive account of the Cold War's biggest nuclear weapons disaster. On January 17, 1966, a U.S. Air Force B-52 bomber exploded over the sleepy Spanish farming village of Palomares during a routine airborne refueling. The explosion killed seven airmen and scattered the bomber's payload-four unarmed thermonuclear bombs-across miles of coastline. Three of the rogue H-bombs were recovered quickly. Tracking down the fourth required the largest search-and-salvage operation in U.S. military history. Moran traces the roots of the Palomares incident, giving a brief yet in-depth history of the Strategic Air Command and its eccentric, larger-than-life commander, General Curtis LeMay, whose massive deterrence strategy kept armed U.S. bombers aloft at all times. Back on the ground, Moran recounts the myriad social and environmental effects of an accident that spread radioactive debris over hundreds of acres of Spanish farmland, alarmed America's strategic allies, and damaged Spanish-American diplomatic relations. As the American military floundered in its attempt to keep the story secret, the events in Spain sometimes took on farcical overtones. Constant global media hype was fueled by the hit James Bond movie Thunderball, with its plot about an atomic weapon lost at sea. In addition, there were the unwanted attentions of a rusty- hulled Soviet surveillance ship and even awkward public relations stunts, complete with American diplomats in swim trunks. 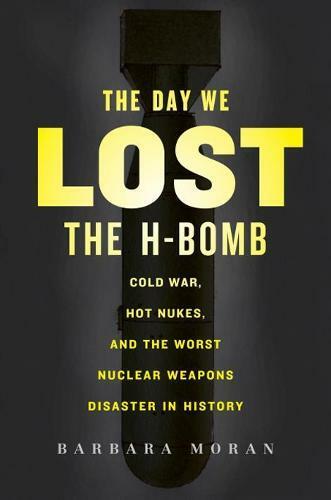 The Day We Lost the H-Bomb is a singular work of military history that effortlessly and dramatically captures Cold War hysteria, high-stakes negotiations, and the race to clean up a disaster of unprecedented scope. At once epic and intimate, this book recounts in stunning detail the fragile peace Americans had made with nuclear weapons-and how the specter of imminent doom forced the United States to consider not only what had happened over Palomares but what could have happened. This forgotten chapter of Cold War history will grip readers with the tension of that time and reawaken the fears and hopes of that dangerous era.